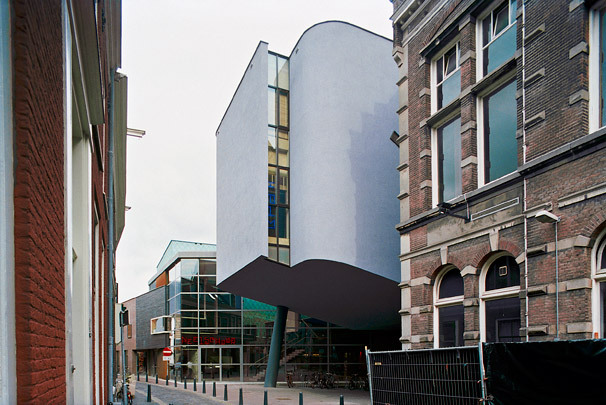 The design for this theatre building in the old historic district of Haarlem is based on a sketch plan by cartoonist Joost Swarte who elaborated the design together with Henk Döll of the Mecanoo architectural practice. The building’s spine is a ‘technical slab’; this is flanked by two theatre auditoria, two film theatres, various foyers, a theatre café and a garage for loading and unloading. Offices occupy a number of historic premises integrated in the complex. The building’s heart is the roomy foyer on the ground floor. Large expanses of glass provide direct contact between inside and outside.